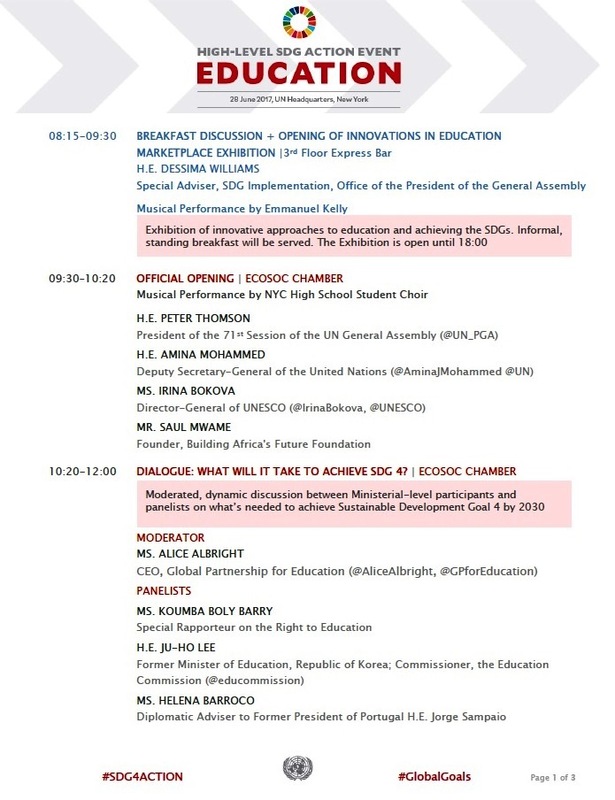 On 28 June, a High-Level Event on Education was convened in partnership with key SDG 4 stakeholders to drive a new push for inclusive and equitable quality education and lifelong learning opportunities for all. Sustainable Development Goal 4, education, is at the heart of the UN’s 2030 Agenda and essential for the success of all Sustainable Development Goals. 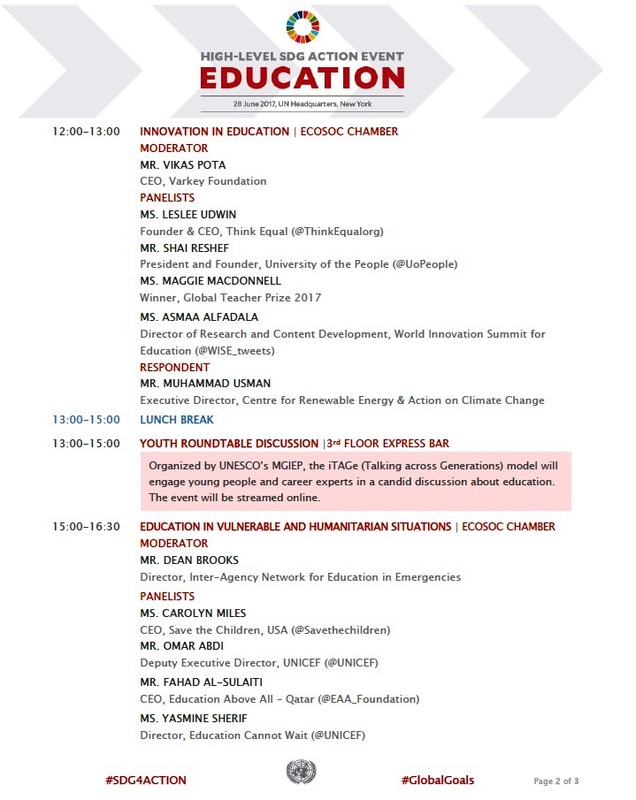 National governments and the international community need to ensure quality education for all; smart, innovative measures to reach young learners, and education and training which are more relevant to addressing the social, environmental and economic challenges that face the world. Education on a basis of equality for girls and boys, women and men across all education systems and initiatives is also critical in achieving gender equality, reducing child mortality, delaying marriage and generating female leaders amongst other factors that contribute to societal progress. Raising awareness of the new development agenda, fostering better understanding about the SDGs and their interconnectedness and promoting global citizenship, all play an instrumental role in making progress not only towards SDG 4, but also towards the entire Agenda 2030. The event elaborated on how to advance the incorporation of the SDGs into the curricula of every school in the world. The President’s High-Level SDG Action Event on Education highlighted the growing momentum around the implementation of SDG 4, including in the area of SDG Learning. It sought to galvanize the efforts of the world’s leading education stakeholders and to raise awareness about the obstacles and opportunities for achieving universal access to quality education and lifelong learning including through technical and vocational education and training. To outline the case for more and better financing to achieve SDG 4, through domestic resource mobilization, bilateral aid and multilateral efforts as well as strong political will and good policies. To encourage integration of innovative technologies in teaching and learning so as to scale up filling the global gap in access and quality education. To further highlight the importance of addressing the challenges which young people are facing in accessing and completing basic and higher education, in conditions of social and geographic fragmentation, and in post-conflict and post-disaster regions. To emphasize the importance of raising awareness and teaching about the SDGs including for the 126 million children who will be eighteen years old in 2030. The full-day high-level event was divided into four sections: opening segment, plenary debate, interactive panel discussions and a closing segment. The President of the General Assembly will present a summary of the discussions as an outcome of the event. The high-level event included participation of the President of the General Assembly, the UN Deputy Secretary-General, High-level representatives from Member States and observers, women, young stakeholders, civil society, UN agencies, education experts, innovators and other relevant stakeholders. 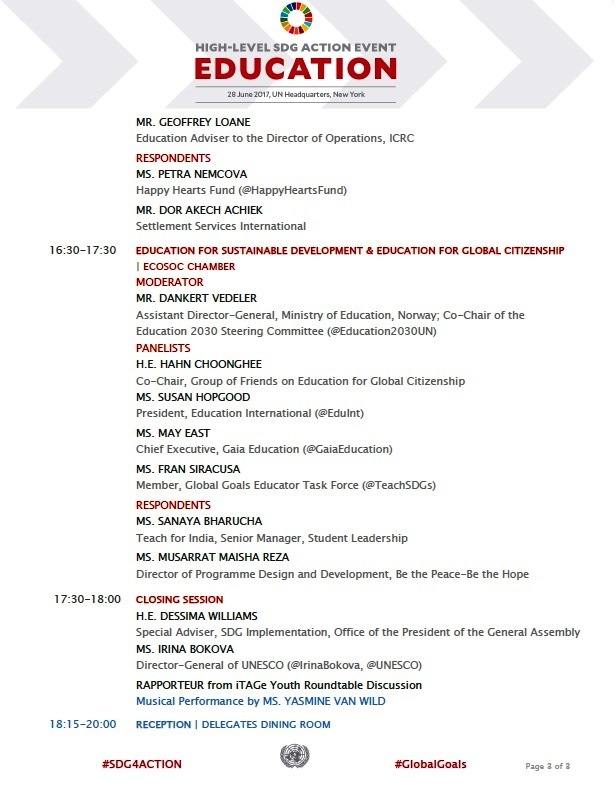 The Office of the President of the General Assembly, worked with UNESCO, UNICEF, FAO, the Global Partnership for Education, the Global Commission on Education, and the Global Education 2030 Steering Committee, among others, in preparing this event. Member States are invited to contribute to the content of the event and to contact the OPGA in this regard.